We share some insights on colour and contrast for data-based information, based on our experience creating a dashboard for Australia’s largest cities. At the DTA we design to 13 criteria for simple, clear and fast government services. Criteria 9 is all about making things easier for users, regardless of their circumstances. 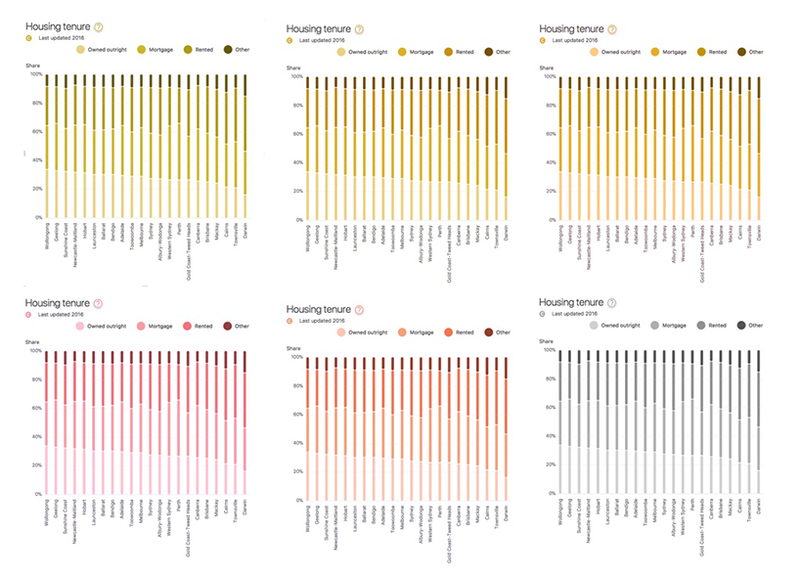 While developing our most recent performance dashboard (for Australia’s largest cities), we learnt quite a bit about accessibility in colour and contrast, and I have shared some of these insights below. 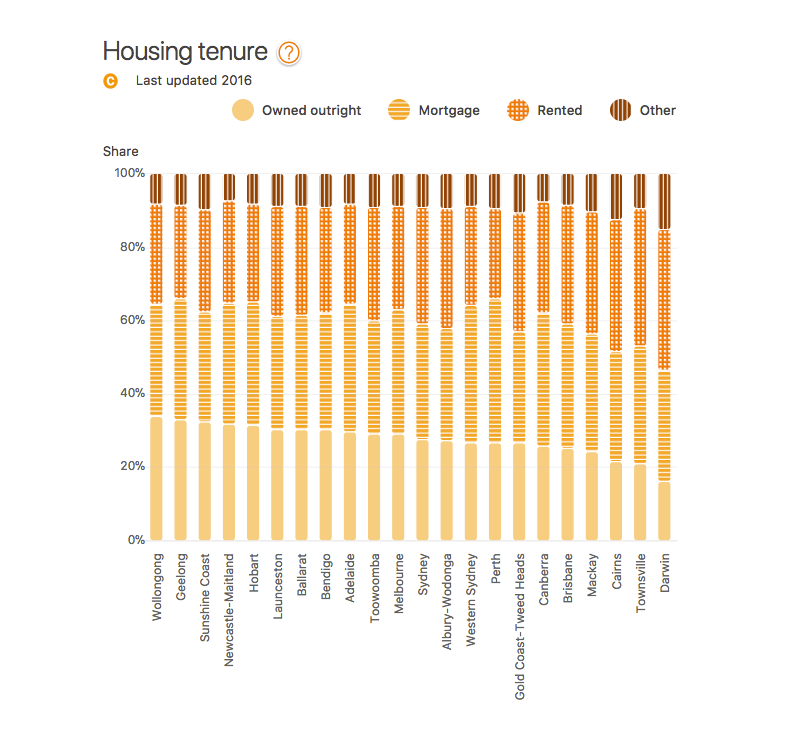 A major group of people who use our dashboard are older Australians. With more than 1 in 7 people aged 65 and over, they are a growing segment of Australia’s population and expected to double in the next 50 years. Half of them are also thought to have low-vision and it’s an issue not limited to their age group. Many people over 40 years old can’t read small text without glasses or bifocals. That’s a natural condition called presbyopia and just one of 7 known colour conditions. So how did these conditions affect our choice of colour and contrast for the Smart Cities dashboard? A key part of our work is using colour to help people understand information. 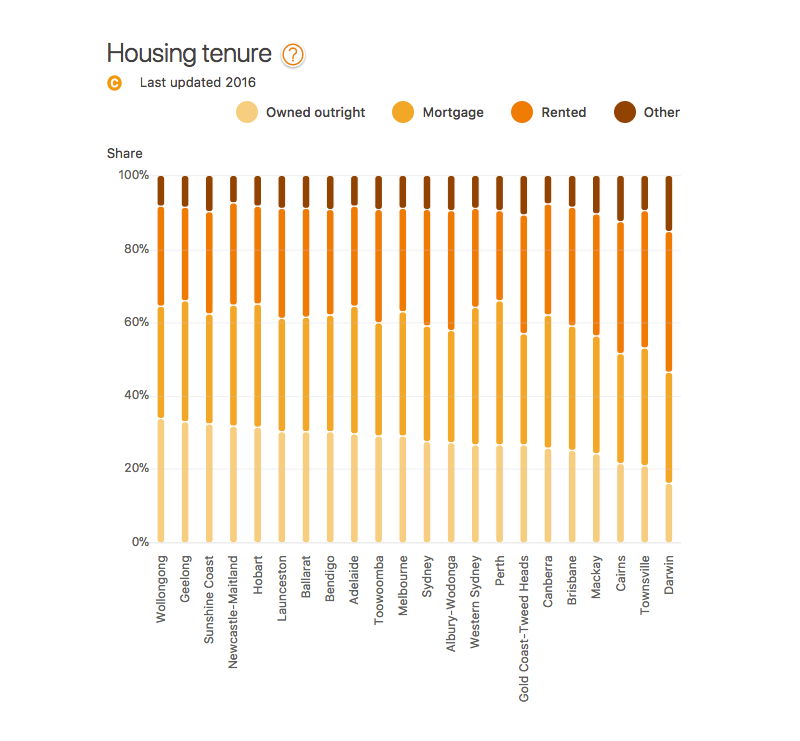 Charts can look completely different to people with colour conditions. In Australia, 9% of us have some form of colour-blindness. Others have vision affected by colour contrast and sizing. Caption: The chart as seen by someone with no colour condition. Caption: The same chart as seen by people with different colour conditions. Red — which is often used to signify danger or negativity. Bright green — which can have positive connotations. Choosing 6 colours within these limitations was hard but we chose the palette based on Google material design colours and ended up with a more neutral bluey-green. We were also selective about which colours appeared next to each other to improve the contrast and make it easier to tell them apart. We then tested the palette with some known colour conditions. There are different ways to do this kind of testing but we used Stark and this palette performed very well. It’s harder to find the right palette if you need to use lots of different colours in your design. One way to overcome this is to overlay patterns which make it easier again for the viewer to differentiate between categories. Caption: Patterns applied to charts help with colour conditions like Protanopia. Applying a pattern helps resolve colour issues by adding another layer of visual distinction. This is especially useful for multicoloured charts. To build these charts and apply these patterns, we used the accessibility module in Highcharts. It’s one thing to come up with a good colour palette but we also needed to take contrast into account. The people that wrote the book on this are the World Wide Web Consortium (W3C), an international community that develops standards for accessibility. It’s their web content accessibility guidelines (WCAG 2.0 AA) which features in our digital criteria for the Australian Government. They also define what minimum contrast should look like for the presentation of text, images of text, contrast ratios, large-scale text, user interface, decoration and logotypes. It can be a challenge to meet the W3C’s standards and keep an interface working in harmony, looking good and pleasant for users. On the dashboard we found having a good colour range really helps. Google material design allowed us to use an extensive colour range which is still manageable. We also needed more colours on the lower end of the range so we were able to create one. It was a big help to have subtle backgrounds to work with, lessening the blow of working with a high contrast accessibility effect. 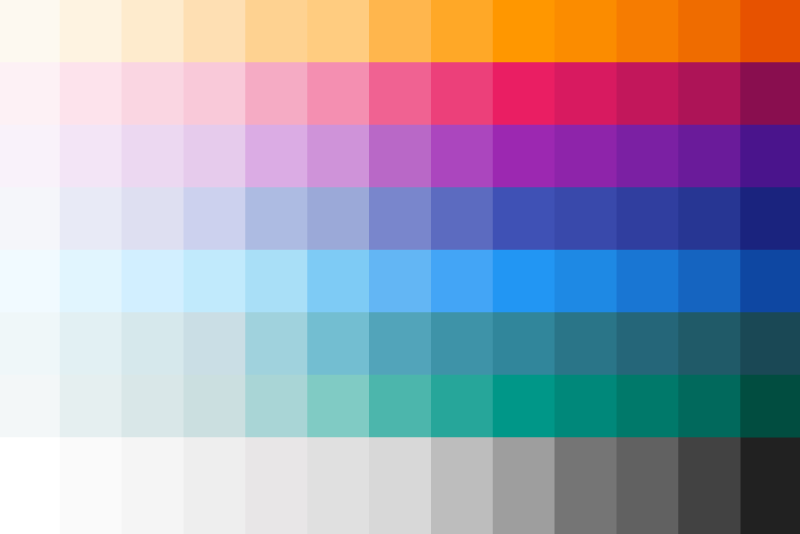 Caption: 3 of the Google material design palettes. Showing a good range but limited in the lighter tones i.e. only 100 and a 50. Caption: The Smart cities dashboard custom palette combined with Google Material Design. We extended the palette to to include a 20, 40, 60, 80 and 90 shade. Also an additional on in the dark - 950. This also is needed to get a good contrast and range to display a chart with multiple legend items. Caption: Implementing the colour system using a main colour for each section and various tones within that colour range. By using a palette like this we can assure to the right levels of contrast to meet the needs of people with colour conditions and simplify the design by using subtitle tones to help communicate the essential data information. Accessible design is where each element works well together. It has the potential to change the way millions of people access and use government services and makes things easier for everyone regardless of their circumstances. Visuals do far more than just please the eye. They create hierarchy, clarity and meaning. It helps users focus on core tasks, features, and information when there is a clear viewing order to the visual elements on a screen. Choose a set of colours that work well with each other for contrast and accessibility. The right colours can also set the tone of your content and help communicate your message clearly. Create a bold interface that brings the user into the experience. Colour is a key component of accessible design. Be bold, graphic and intentional. What is the context of your design? What kind of activity does your service promote? What is its purpose, when, where and how will it be accessed? Every colour has connotations. Know what these are and make them fit your purpose. Individual visual elements and colours are great, but how do they work in the bigger picture of your product? Consider how visuals for the whole product affects the meaning and connection for your users. getstark.co — use Stark to work with Sketch. Easily check colour contrast and view what you’re doing through different colour conditions. colordrop.io — a better way to visually see and search for colour palettes. 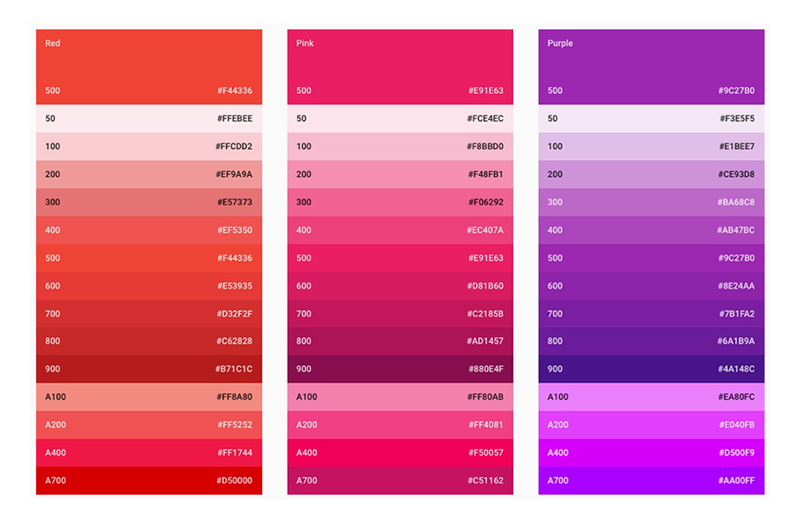 lolcolors — well presented colour palettes. material.io — check contrast with multiple screens and colour pallettes at the same time. coolors.co — a large single colour palette selection. If you want to know more about accessible design, have a look at our blog about going beyond the guidelines. If you have any questions about the smart cities dashboard, leave a message below or contact dashboard@digital.gov.au. Nick Nelson is an interaction designer on the dashboard team at the DTA.